These are a lightened-up on the classic: banana chocolate chip muffins make a fantastic breakfast or snack! I love banana bread. I have fond memories growing up of my mom making it: the kitchen would fill with that tantalizing smell, and then when it came out of the oven she’d make us wait 10 minutes for it cool down before cutting into it. Longest 10 minutes ever. 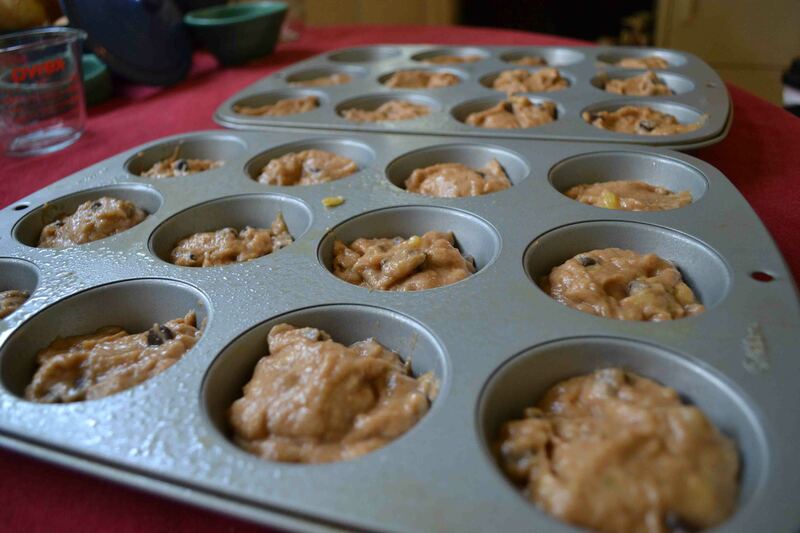 Now I still make mom’s recipe sometimes, but recently I discovered a version in muffin form that’s a little healthier in the batter, but also has chocolate chips. Any excuse to eat chocolate for breakfast, right? Plus they’re some of my husband’s favorite. So to welcome him home from Field Training, I made a batch waiting for him when he got home from the airport. Start with your bananas. Make sure they’re a little overripe, that helps the flavor stand out. Once the bananas are good and mushed, add your sugar and eggs. 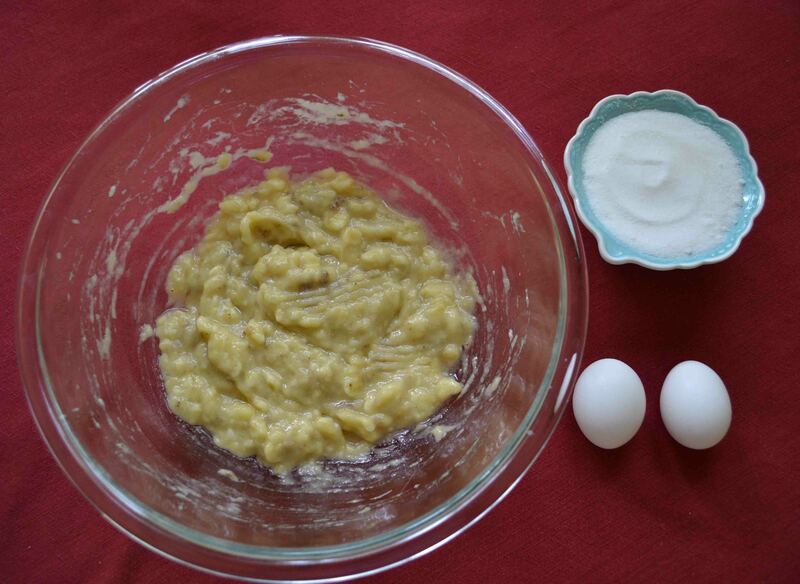 I like to beat the egg just before adding it – makes sure the yolk and white distribute evenly in the mixing process. And finally, get those chocolate chips in! It’s such a simple recipe. 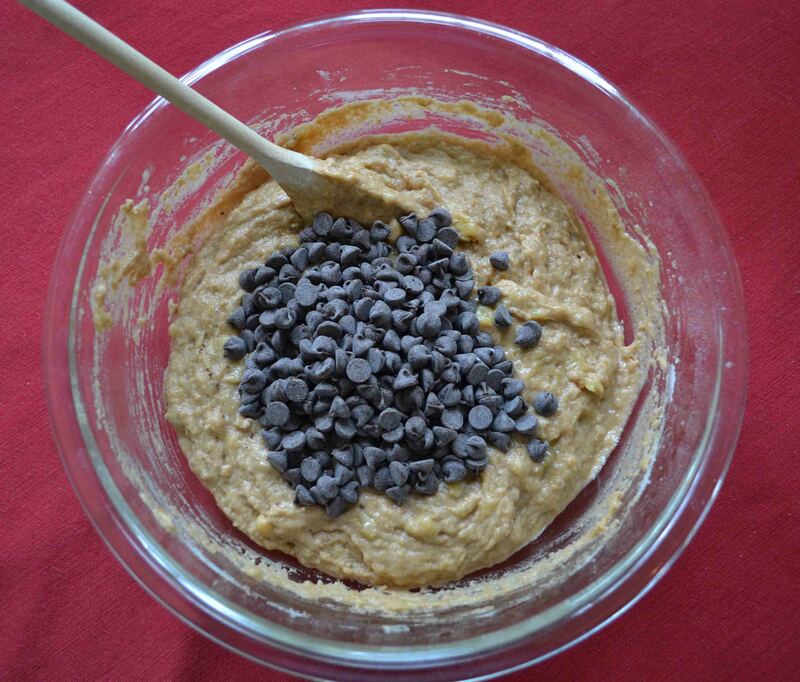 Combine your wet ingredients, stir in your dry ingredients, and add those chocolate chips! 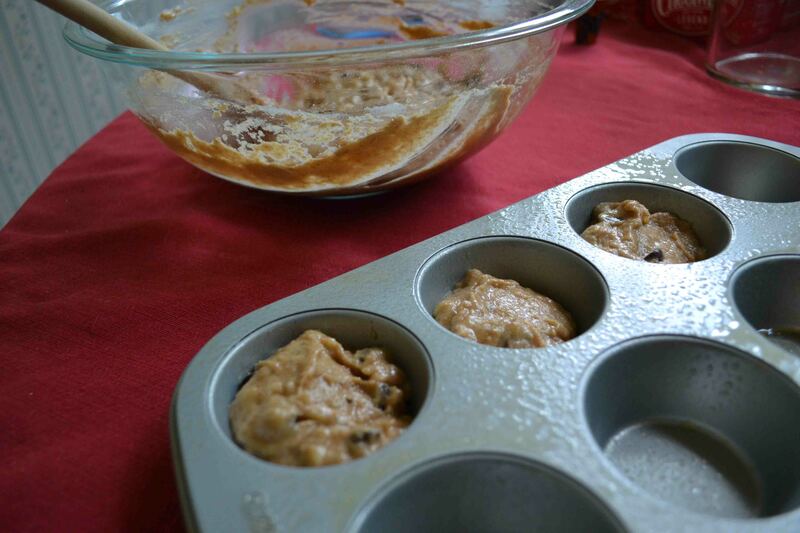 From there just spoon it into your muffin tins – I’m cheap and just grease the pans instead of using cupcake liners. Another plus: easy clean up! Just one bowl needed, and you can hand-stir everything easily! All ready to get in the oven! I sprinkled a little cinnamon on top after pulling them from the oven. Next time, I’d do the sprinkling before putting it in the oven instead. The final product! They’re a little denser than your average muffin, I think because of the whole wheat flour combined with applesauce. And make no mistake, it’s not too dense, only less fluffy than your average muffin. But just remember, it’s WAY healthier! Yay! Honestly, this pretty much fits my personality: making some great healthy choices, but not afraid to throw that chocolate right back in there. Another tip: the recipe makes about 10. If I’m taking them to a brunch or people are staying over at our house I always make a double batch, but if it’s just Logan and I we try and stick to one. But the upside is they freeze pretty well, so if you’re worried about some getting wasted just toss them in the freezer! Stir in applesauce and vanilla. 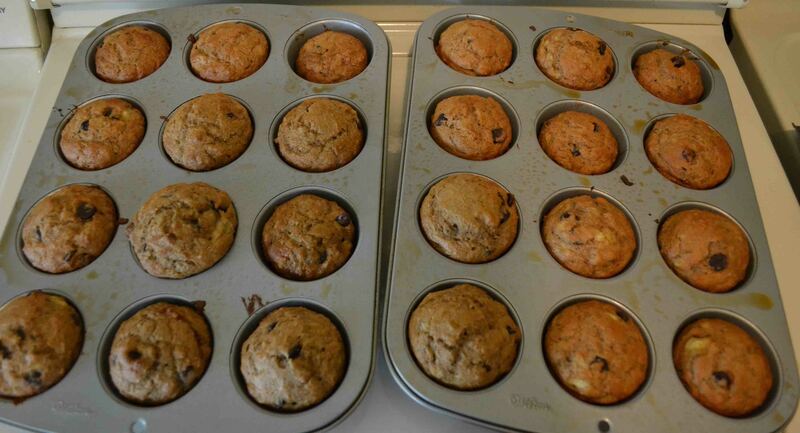 Put in muffin tins – either use liners or spray first. Sprinkle a bit of cinnamon on top of each muffin (if desired). Bake at 350º for 18-20 minutes. That’s it! Like I said, so easy. These are the trifecta of great: easy to make, easy to clean up,and (most importantly) delicious!